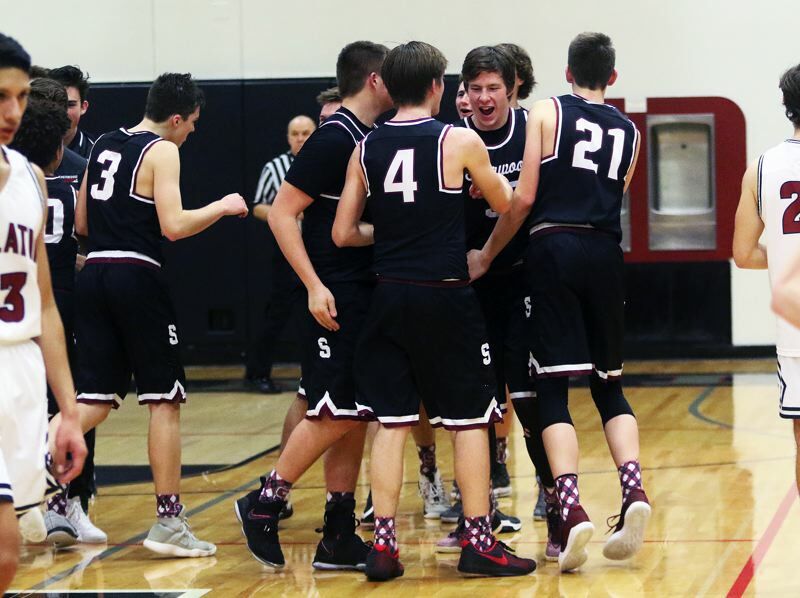 TUALATIN — Sure, the Sherwood High School boys basketball team knew that it was taking on a talented foe in Tualatin. And, yes, the Bowmen knew that the Timberwolves were especially tough on their home court. But that didn't matter to them. They were ready to battle. And Sherwood ended the battle as the victor. 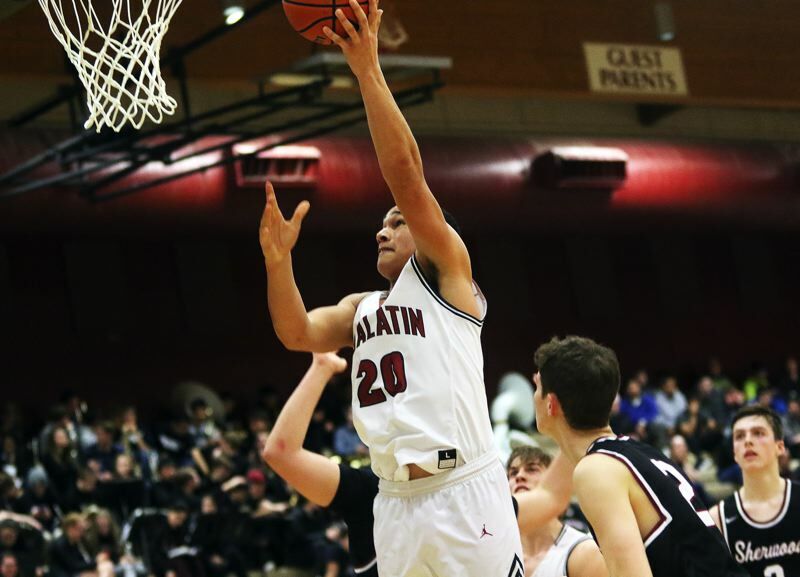 The Bowmen, stepping up in the second quarter, and then again in the fourth, scored a 53-45 win over the Timberwolves in a Three Rivers League game played in front of an enthusiastic crowd Friday at Tualatin High School. 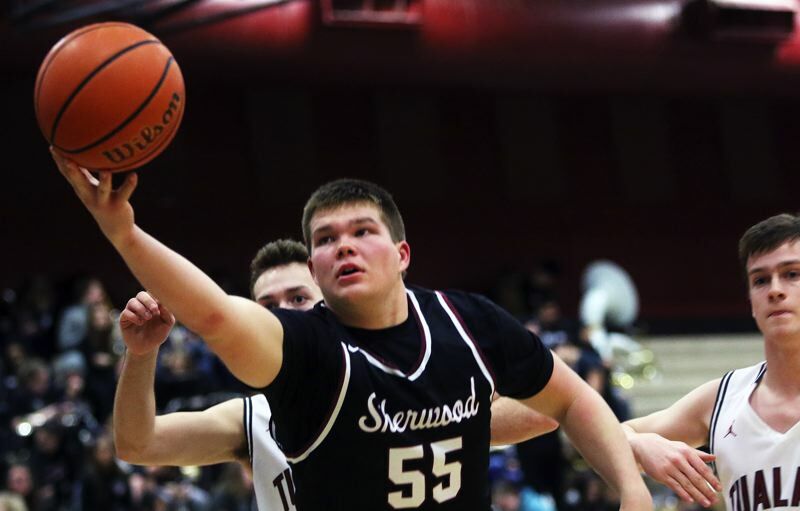 "Oh, this is huge," said Sherwood senior wing Nic Koronko, who led the Bowmen with 16 points in the win. "Tualatin is a really good team, and to come here and put a smack on them is nice. I'm really proud of all my teammates." 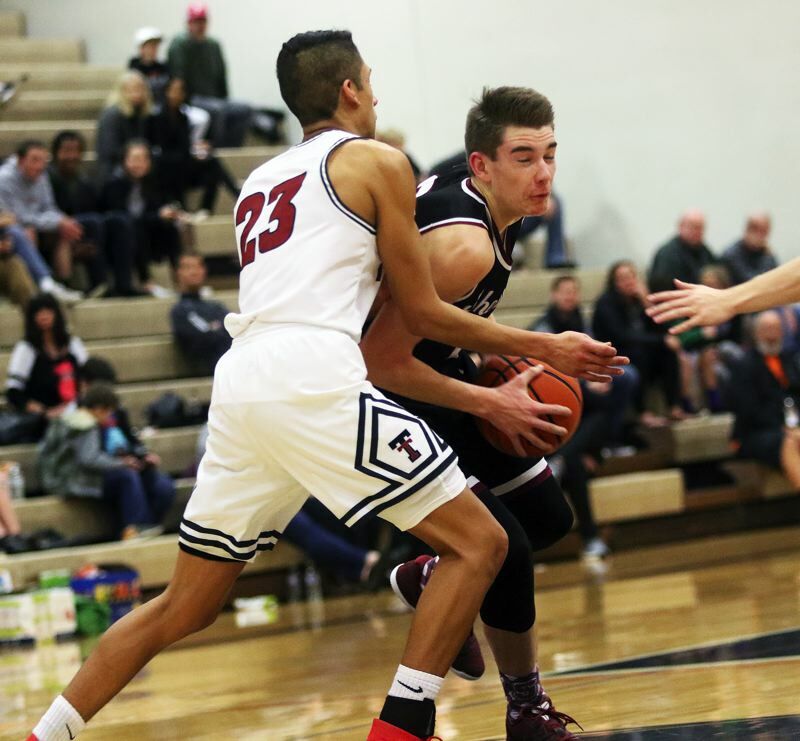 "Tualatin is a great team, and they're great on their home court," Sherwood sophomore guard Jamison Guerra said. "But we like having everyone yell at us. We like being the hated guys." With the loss, Tualatin moved to 4-3 in TRL play (12-5 overall) at that point, putting the Wolves in a tie with Sherwood for fourth place in the league standings. The Bowmen improved to 4-3 in TRL games, and to 11-6 on the season, with the victory. "We haven't peaked yet," Guerra said. "This was a springboard." Sherwood got off to a strong start in Friday's game. Koronko started the contest with a three-point basket. Bowmen senior post Jace Sucher added a short-range bank shot and junior wing Braden Thorn connected on a three-pointer of his own, giving the victors an 8-4 lead with 2 minutes and 8 seconds left to play in the first quarter. But Tualatin, with senior guard Alexis Angeles scoring five points in the final 1:30 of the period, trimmed the Sherwood lead to 10-9 going into the second quarter. 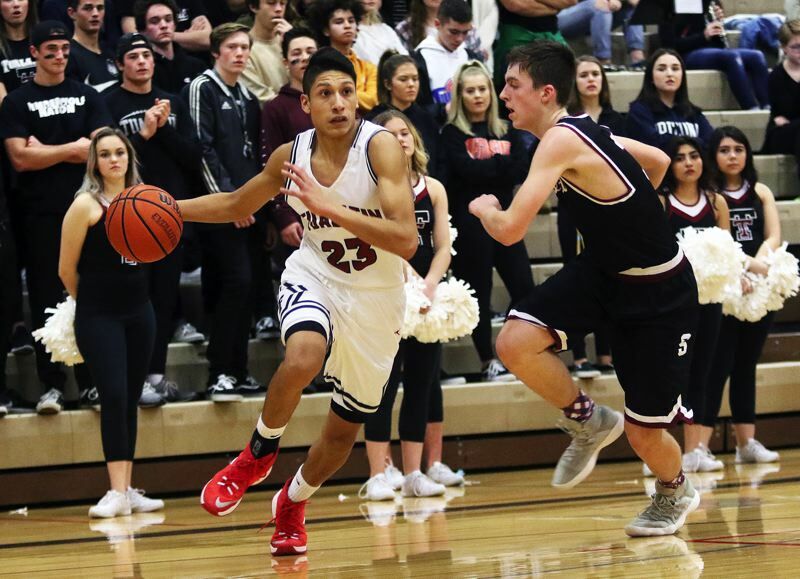 The Bowmen, behind the shooting of senior wing Jordan Gregory, quickly regained momentum. Gregory opened the period with a three-point basket from the left corner. 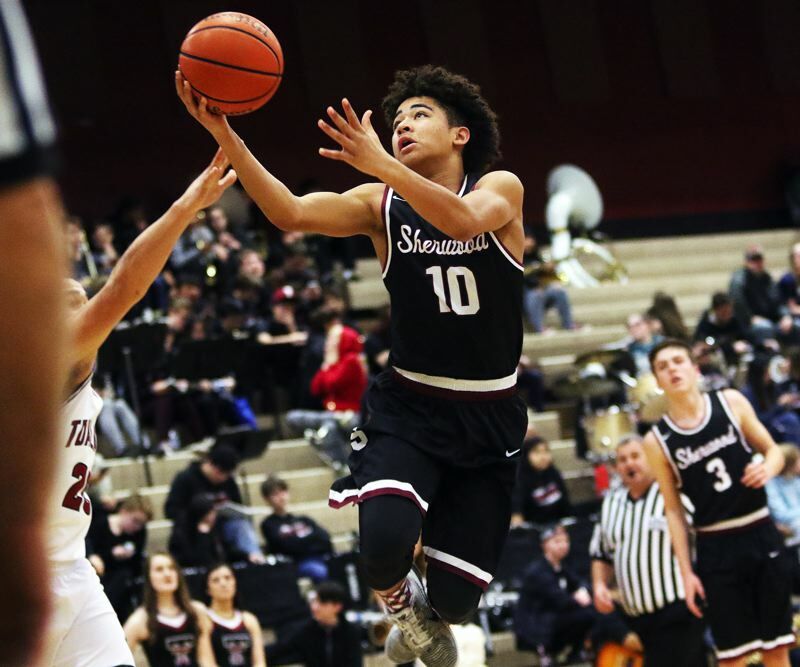 Then, on Sherwood's next possession, Gregory drilled a three-pointer from the right corner, coming off a pass from Guerra, to give the Bowmen a 16-9 lead with 6:42 remaining in the first half. "He earned that," Sherwood coach Rahim Tufts said. "He's worked hard." The Bowmen went on to up the margin to 20-12 after Thorn scored a follow-up basket with 5:30 left in the second quarter. The Wolves came battling back. Junior post Bridger Steppe scored on a follow-up shot, sophomore wing John Miller sank a pair of free throws and Steppe added a basket on a drive to the hoop, trimming the margin to 20-18 with 3:16 remaining in the period. Sherwood, getting a three-pointer by Thorn, off a pass from senior Tyler Thiebes, with 1:48 left in the quarter, would go on to hold a 23-18 halftime lead. But Tualatin came out strong to start the third quarter. Junior Jack Rose opened the period with an alley-oop layup, off a pass from Miller, and Rose then scored on a follow-up shot to trim the Sherwood lead to 23-22. Koronko answered with back-to-back baskets on foul-line jumpers, but the Wolves came roaring back again. Tualatin junior wing Caden Dickson sank a three-pointer from the left corner, Angeles scored on a drive and Rose put in another alley-oop layup, this one off a pass from senior Lucas Noland, giving the Wolves their first lead of the game, at 29-27, with 4:06 remaining in the quarter. Tualatin, with Angeles scoring seven points in the final 2:56 of the period, would go on to take a 38-36 lead into the fourth quarter. Guerra opened the final stanza with a pair of free throws, and he followed that up with a three-pointer from the left side, regaining the lead for the Bowmen, at 41-38, with 5:35 left to play in the contest. Rose got the Wolves back within two, at 43-41, with another alley-oop layup from Noland, coming with 2:27 remaining. But Tualatin wouldn't be able to get any closer. Koronko sank a 6-foot baseline jumper and Sucher went 2 for 2 from the foul line to push the lead to 47-41 with 54 seconds left to play. Gregory, junior Tyler Hix, Koronko and Guerra then sank free throws down the stretch to help the Bowmen wrap up the 53-45 win. "Our defense did great," Koronko said. "We kept playing hard. That was the key. Alexis got 20, but it was a tough 20. I'm really proud of our team." "That was exciting," Guerra said. "We played as a team, and our fans really showed up. That's as fun as it gets." Koronko scored 13 of his team-high 16 points in the second half. Guerra added 10 points. He also had two assists and six rebounds, all coming in second half. Thorn scored eight points, all coming in the first half and Gregory had seven. Sucher had five rebounds to go with four points. Sherwood, as a team, made 15 of 40 shots from the field, with eight three-pointers, and 15 of 20 free-throw attempts. "The theme of the week was toughness," Tufts said. "We weren't going to be outcompeted. We talk about bringing energy every game. Guys stepped up and made huge plays. They wanted it. Jamison was the floor leader out there and Tyler Hix did a great job on defense." Angeles led all scorers in the contest with 20 points. He also had four rebounds. Rose scored 12 points, including nine in the second half. Also for the Wolves, Miller had six points and six rebounds, Steppe scored four points and senior Chris Freese had five rebounds. 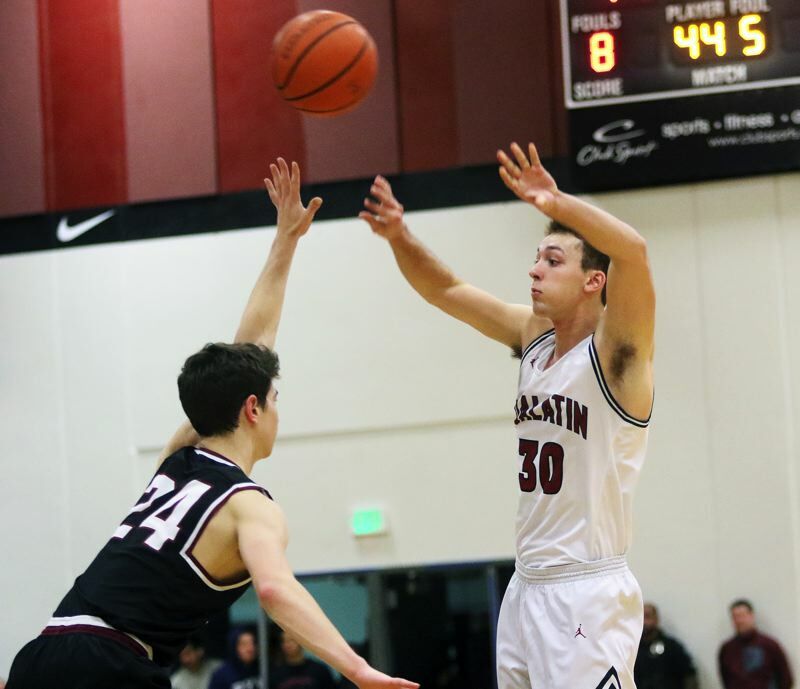 Tualatin, as a team, made 17 of 58 shots from the field, with one three-pointer, and 10 of 14 free-throw attempts. On Tuesday, Sherwood was tipped 47-42, in overtime, by Canby in a league game played at Canby High School. Guerra scored 20 points for the Bowmen in that game, and Koronko added 10. Tualatin, on Tuesday, bounced back to post a 63-62 home league victory over Lakeridge. Angeles scored 21 points in the win, and Rose added 12. Both teams will be back in action with league games on Friday. The Wolves will play at Newberg at 5:45 p.m. and Sherwood will host Tigard at 7 p.m. On Tuesday, Sherwood will play at Lakeridge at 6 p.m. and Tualatin will travel to Canby for a 7 p.m. contest.